One thing that I love doing is making pizza from scratch. Nothing tastes quite the same as homemade pizza. 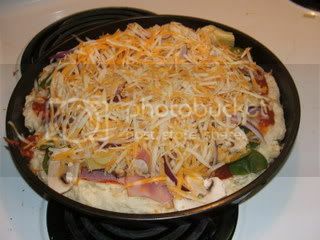 For years I would buy the packages for making pizza where you open the packet and mix it with flour to make the crust. For awhile I did the Boboli ready made crusts. 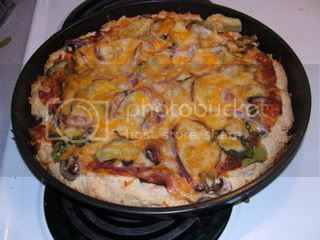 Then a friend of mine turned me on to this biscuit crust from the Pizza book by Company's Coming and I've been using it ever since. It's very yummy! Measure first 5 ingredients inot a medium bowl. Cut in margarine until crumbly. Add milk and cheese. Stir together to form soft ball. Knead on lightly floured surface 8 times. Roll out and press inot greased 12 inch pizza pan, forming rim around edge.